Escorting clients into EMW Women’s Surgical Center abortion clinic is sometimes like an obstacle course. 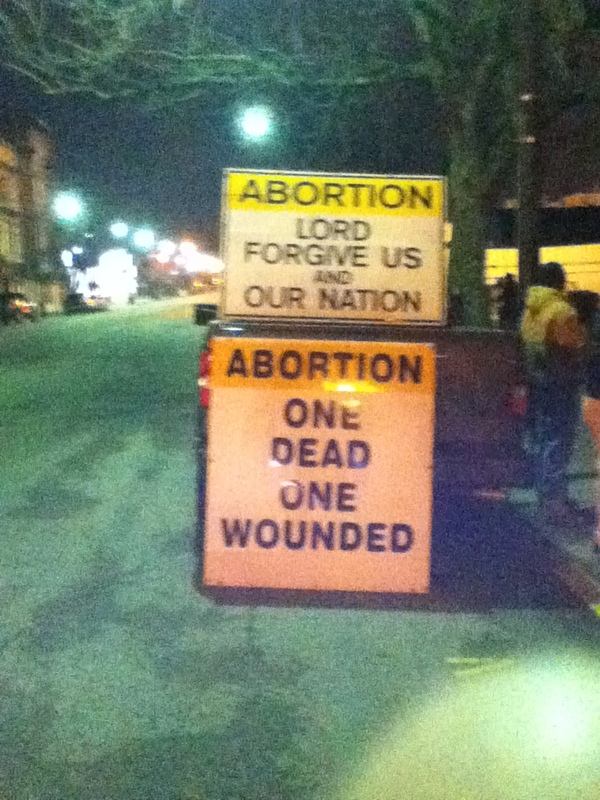 In addition to anti-abortion protesters, we have sidewalk preachers, prayer groups, giant crosses and signs. There are a lot of anti-abortion signs propped on parked cars, propped on the sidewalk, and carried by protesters. Some of these carried signs are held in the antis’ hands and some are hung by cords around their necks. Some of these signs are written words, some are what are supposed to be fetal photographs, and some are a combination. One sign that frequently shows up is a handwritten statement four-feet tall. You have to be close to this sign in order to read all of it. On a normal weekday or Saturday, there are only a few signs. The week between Christmas and New Year seemed to have many more than normal. The escorts joked the antis must have spent their holiday gift money on new signs. There were a lot of obviously new signs; big and little; carried and propped. There was a real hazard moving between and around the sheer number of signs. It seemed as if everyone with a sign was in a competition to have their sign viewed by clients and companions. I would like to declare the winner in this sign competition. These signs weren’t new, but we don’t see them often. This photo gives you a sense of the size of these signs strapped on the back of pickup truck. The truck was parked directly in front of the entrance of the clinic. To miss these signs, a person would have had to have their eyes shut driving or walking to the clinic door from the west. This display makes a statement, but to me the statement is to avoid the owner of these signs. I am wondering if we will see a new competition at the next holiday. 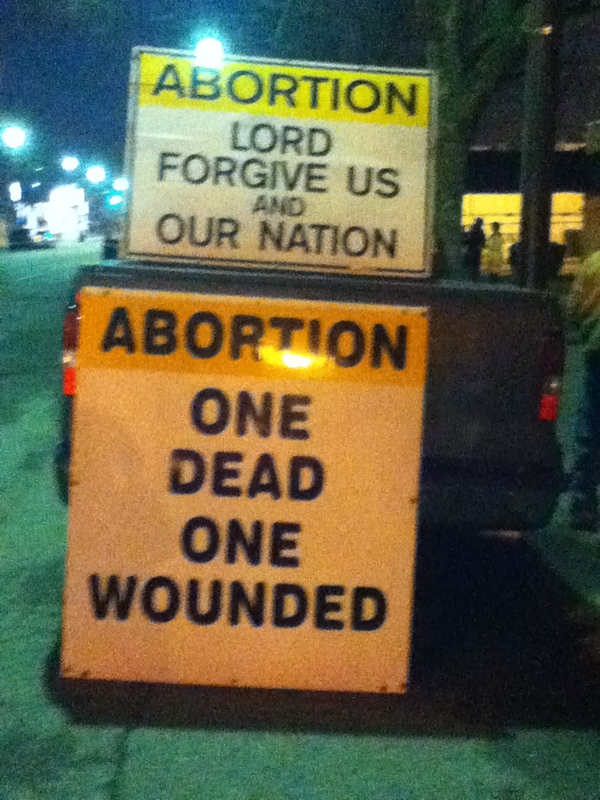 This entry was posted in abortion, Anti-Choice protesters, Louiville Ky, pro-access, pro-choice, Uncategorized and tagged abortion, Access, clinic, EMW, harassment, Louisville KY, protester by Servalbear. Bookmark the permalink. I have considered standing out next to them, with pro-choice signs…. Escorts cannot counter-protest because it would be contrary to the Points of Unity under which we operate. Now if some pro-access activist that wasn’t escorting were to come out with other signs, I’m sure it would put a smile on our faces. But then again, it could escalate the chaos on the sidewalk and that wouldn’t be good for clients. It’s a nice thought though, isn’t it? We have found the best thing is to ignore them at the time and write about it later. Nice take on “the billboard battles of ’11”. I used to loathe these signs. Then one morning a client told me she was totally lost and had no idea where the clinic was. She wandered around downtown, bewildered. Then she saw the signs and knew she was at the clinic. So thanks, sign bearers, for helping this lost soul find her way through the darkness to do what was best for her family and her health. Thanks for pointing out the positive in the signs! The clinic is hard to miss because of them, especially on Saturdays.